Ballpark Basics: A classic ballpark befitting a classic team. 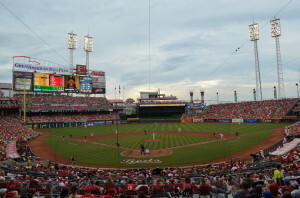 Back in 2010 we had hoped to make a game at the Great American Ballpark. Unfortunately they moved the start time of the game up to be a FOX game of the week and we weren’t able to get there in time. However, we were are not easily deterred and we were able to schedule another trip to Cincinnati during the 2013 campaign. Once again it was a national FOX game of the week, this time against their division rivals, Pittsburgh Pirates. A later game start time also worked to our advantage and we were able to try out some of the city’s local breweries in the morning. At many MLB parks, much money is spent before you even get in the door with parking and tickets. In Cincinnati the potential is there for more of the same, but a smart fan can save some money. While there are multiple garages charging $10 a car close to the ballpark, we were able to find street parking for free just a few blocks away and we walked over to the Great American Ballpark (or GABP). Built next to where Riverfront Stadium used to stand, this place erases all memory of that concrete donut. Being a Saturday afternoon game in July the temperature was already creeping up into the nineties as we talked with many of the scalpers surrounding the place for blocks. Our only requirement being that we “just want to get in the game, man” we were able to get great seats down the first base side in the shade for below face value. There were multiple police officers monitoring these supposedly illicit sales, but they appear to turn a blind eye to the scalpers. Another nice aspect outside the park is Freedom Way. The city has created an avenue that connects GABP with Paul Brown Stadium, home of the NFL’s Bengals and includes the National Underground Railroad Freedom Center, a museum dedicated to telling the story of slavery . And of course, Freedom Way is also lined with restaurants and bars, which makes it a popular place to grab a bite and drink before the game (or in our case, after). 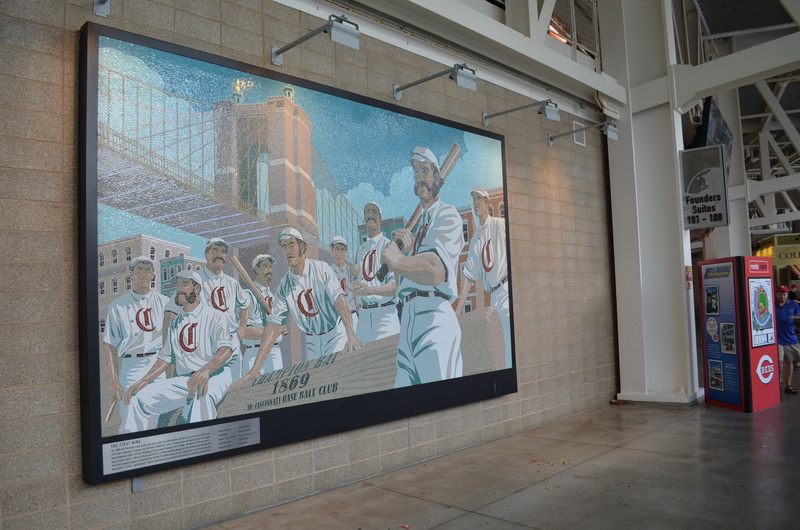 With a history as long and storied as the Reds it is good to see the team incorporate aspects of the team’s past throughout the ballpark. It starts with Crosley Terrace behind the home plate entrance. Mimicking one of the most unique aspects of any ballpark Crosley Terrace has the same incline as the hill in outfield of the former home of the Reds. Along with the terrace there are statues to former Reds Joe Nuxhall, Ernie Lombardi, Ted Kluszewski, and Frank Robinson. This is also where the ticket offices are housed and most people enter the ballpark. Once inside there are two large mosaics on the concourse behind home plate. One showing “The First Nine”, the first professional baseball team and the other shows “The Great Eight” from the Big Red Machine during the 70’s. Another nod to the Reds history is the Reds Hall of Fame. A large building that sits next to the ballpark with a walkway to connect you. During the rain delay they mentioned that going to the Reds HOF would be a great way to pass the time – they didn’t mention the $10 price of admission. Neither of us are big enough Reds fans to warrant the entry fee even though we have total respect for the Big Red Machine and the oldest professional baseball team. Once inside the seating bowl you have a chance to look around and see some of the aspects that distinguish Great American Ballpark from others. The most notable is the large steamboat in centerfield. 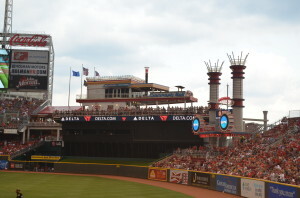 An homage to the commerce that has gone up and down the Ohio River in the background, this feature has smokestacks that shoot off fireworks for Reds’ home runs and after each Red victory. While placed on the banks of the Ohio River, the water does not dominate the backdrop like in other water fronting ballparks. However, there is a nice walkway behind the right field wall that offers great views of the river and the John A. Roebling Suspension Bridge. Another interesting aspect of the park is the cut out in the upper deck. The upper deck is split into two different sections with a large cut out that gives fans a small glimpse of downtown Cincinnati (and certain lucky office workers a peek into the ballpark). As we walked around the park we saw a couple of local craft beer options but they were few and far between. Luckily that has all changed. 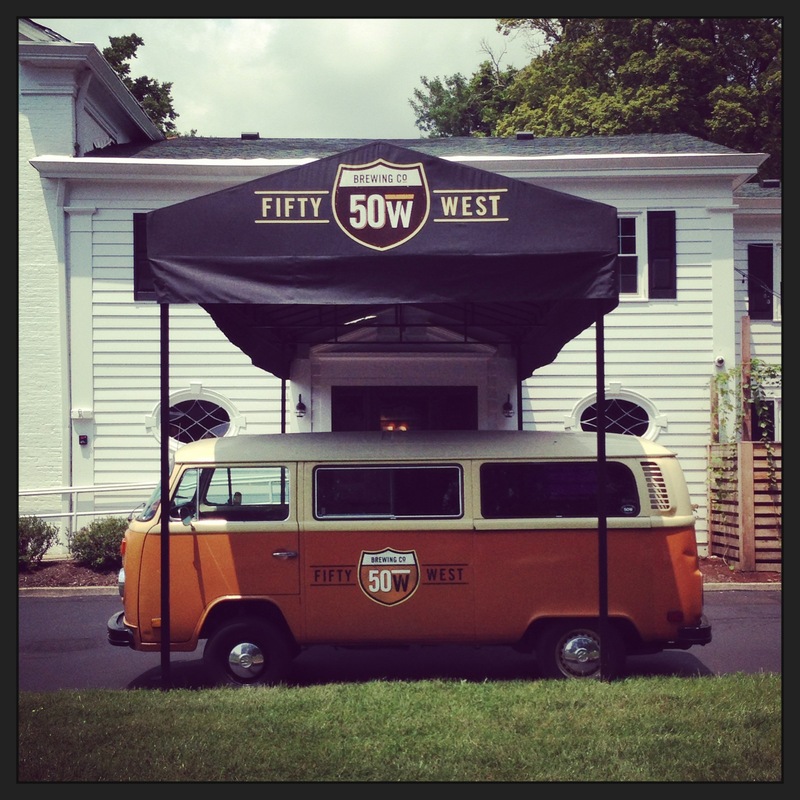 New for the 2014 season is The Reds Brewery District, an 85-foot-long bar that houses 60 taps featuring 23 different craft beers plus some options from the big boys. 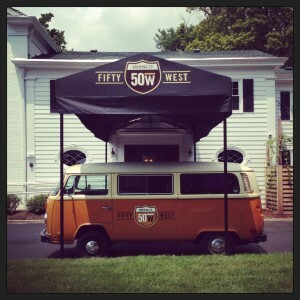 Here you will find a treasure trove of local craft beers including selections from Christian Moerlein, MadTree, Blank Slate, 50 West, Rhinegeist, Mt. Carmel and Rivertown. On top of the Brewery District there are also to Moerlein Lager Houses (one on the first base side and the other on third base). 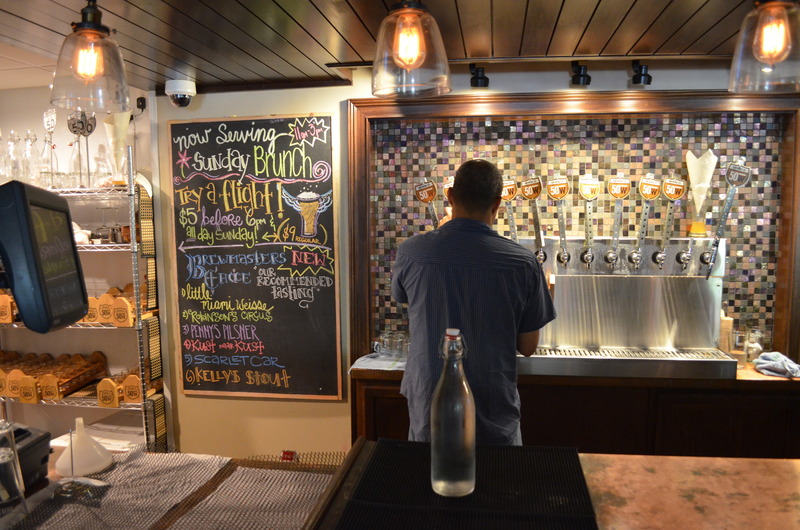 These two craft beer concession stands offer several local favorites as well as 48 different bottle selections. The only real mark against the park is any sort of signature backdrop. With the river behind the stadium and not much else on the other shore no buildings or skyline dominate the view. Your only real indication of where you are is the steamboat in center field. If you want views of downtown as you watch the game opt for a ticket in the right field corner. This will give you a great view of the field as well as the downtown buildings (with the Great American Insurance Company building being front and center). So really there is not too much to complain about. 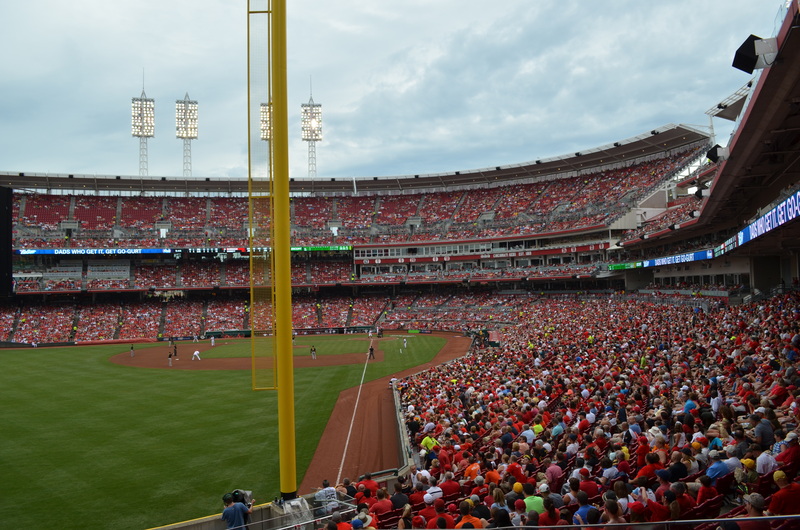 Great American Insurance is the company behind the naming rights for the Reds’ home. 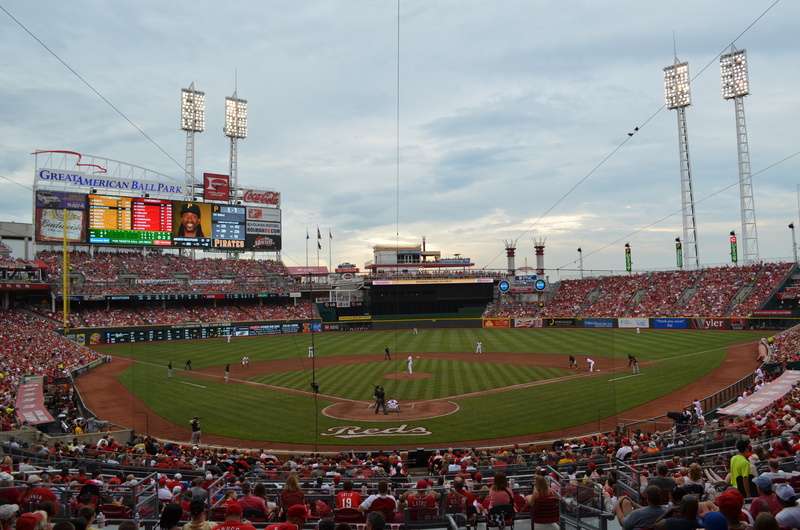 While it seems a bit presumptuous to name your ballpark “The Great American Ballpark” in the case of Cincinnati’s ballpark it is a fitting name. Brewery Basics: Oh, if these walls could talk! Wooster Pike, aka Rt. 50, was once the main road from Ocean City, Maryland to Sacramento, California. Drive down the right part of this road while traveling through Cincinnati and you might come across an old German farmhouse right off to the side. It’s been there since 1827, and as you can imagine it’s seen a lot of changes in those near 200 years. It’s been a family home, a restaurant, a brothel and since December of 2013, the three main rooms of the modernized-but-still-rustic farmhouse have been home to Fifty West Brewing. The rooms are sectioned off; first, there’s a quieter lounge area with couches (?) and sleeveless records on the walls. Then, a long copper top bar with Edison bulbs and a low wood-beamed ceiling, followed by a dining area and even a game room with plenty of space for friends. 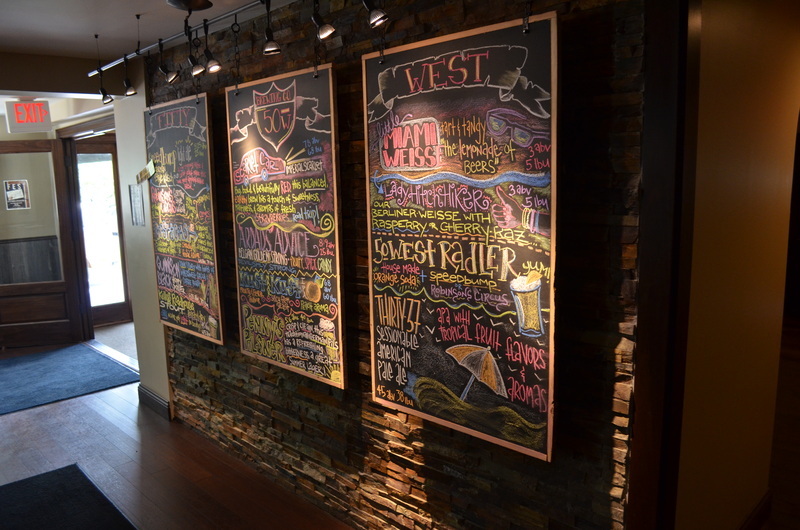 Colorful and artfully decorated chalkboards abound, highlighting the twelve beers on tap. On any given day here you’ll find lots of flavors and styles, little twists on the usual. We arrived just a few minutes after they opened for the day, so there wasn’t a lot going on. But the bartender at the time seemed not quite ready to start his day. Fortunately, with all the different taps, there was plenty for us to sort through before we were ready to order our flight. And before we were even half through our tasting, he’d perked up and another bartender, Anthony had joined him, which is how we had a chance to learn the aforementioned history of the place, and also a little about their beers. Little Miami Weisse (3% ABV/ 5 IBU) This beer would have ranked somewhere in the negative numbers if you were placing it on the color scale. The closest (and most appropriate) thing we could match it to was the color of key lime pie – but maybe not even that pigmented. Noted on the chalkboard as “the lemonade of beers” it smelled sour and citrusy, but the lemon citrus didn’t really come through in the taste. In fact all it really was, was tart. Might be good if you are into the sour beers, but we’re not. Thirty-37 (4.5 ABV/ 38 IBU) An American Pale Ale with tropical fruit that is most noticeable in the aroma, and gives it a sweet, beachy vibe. This solid gold beer is a great summer beer, especially for those who typically don’t like summer beers because there’s a lot going on here. The hops hit you right away, it’s still a milder hot-day drinker but while light it is fully-flavored. That hoppy start finishes tangy with the tropical fruits. If you like Shiner’s Ruby Redbird, this one is for you! Penny’s Pilsner (5.6 ABV/ 40 IBU) – Another lightly colored beer, but not white like the Little Miami. Jim thought it had kind of a traditional musty smell, but Gillian thought this one smelled like sunscreen or clean hand lotion isn’t the first thing you want to drink. Penny’s Pilsner is highly carbonated so that’s what you taste mostly in the sip, with a dry, clean but bitter finish. Kust Naar Kust (6.8 ABV/ 60 IBU) – An IPA with a light amber color and lacing. Smelled like flowers, tasted like flowers. No bitterness to this IPA, but a bit of a pepper-cracker end. Definitely not your typical IPA. Although it sounds strange, you have to try this one to understand. It actually ended up being Jim’s favorite. Scarlet Car (7.8 ABV/ 68 IBU) – This is an interesting imperial red ale. It poured a muddy pecan – maple color, kind of like apple cider, and it’s unfiltered. The smell is sweet like strawberry jam with a grainy start – not in consistency but in flavor which then turns to strawberry jam for the finish. This was Gillian’s favorite. Kelly’s Roadhouse Stout (45 ABV/ 6 IBU) – As a good stout is, Kelly’s Roadhouse is dark with ruby notes. It’s watery – light bodied start builds to a roast nut/woodsy finish. Not heavy as a typical dark beer, but this was their take on a summer stout, managing to be dark and light at the same time. Coast to Coast (6.5 ABV/ 82 IBU) – Another APA, the copper colored Coast to Coast is light, summery and highly carbonated. It’s got a good hop nose, quick bite and a balanced malty end. A good, straightforward American Pale. Wheateater (5.25 ABV/ 25 IBU) – A collaboration with another local brewery, Madtree, and made for a kid whose favorite beer was Shock Top. So in that vein, this is another light hued beer – probably a one on the color scale. Smelled very light and mainly of wheat with just a hint of orange citrus. 50 West reports that it’s 15% hops. Bonus Beer Shop: Dutch’s – When we head to a new town we always ask the locals (often times at the breweries) where we can find a good local beer store. In Cincinnati everyone pointed us in the direction of Dutch’s, and boy were we glad they did. Dutch’s Beer store can be found in the Hyde Park section of Cincinnati. While there is an inside section with a bar and food service we never made it that far. 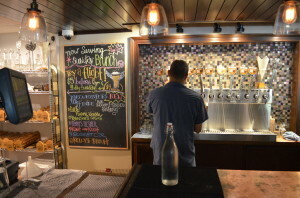 A garage door opens to a wide variety of beers from far and wide (and nearby as well) that you can peruse while you stand on the sidewalk outside the shop. With a knowledgeable staff that was willing to help us pick out some local beers we ended up spending too much time and money at Dutch’s (but it was all well worth it).